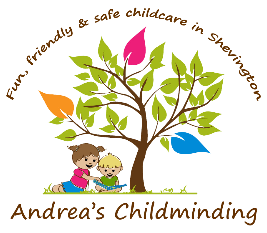 I provide a warm, loving and safe environment for all children in my care. As every child is unique, I will form a positive relationship with every child and work closely with all parents or carers to ensure you and your child’s needs, interests and feelings are supported. I have a stimulating and fun environment with resources for different age groups of children. I hope that with my help children will have fun, laugh, learn and develop. I have a separate play room filled with various toys and books. 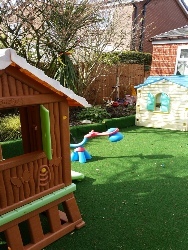 I have a home corner for role play, books, audio material for songtime, puzzles and a back garden for outdoor play. I encourage children to form their own personalities and I take children to different places such as parks, go on walks, picnics, farms, shops, playgroups, physibodies , different modes of transport and many more to help them explore and socialize for themselves. I live in Shevington with my fiancé Jay and my teenage twins Libby and Aaron. I have a seven seat car which enables me to accommodate all children on our various adventures. I have completed the required Ofsted training courses together with my Food safety certificate, Advanced Hygiene certificate, Health and Safety certificate, DBS check and public liability insurance and paediatric first aid.